Chefs aprons are a vital part of any successful kitchen. As well as keeping your staff protected from hot splashes of oil and other potentially harmful things, a good chefs apron will look great, creating a strong sense of unity in the kitchen, as well as helping to differentiate between the different ranks of chef. At Pattersons Catering Supplies, our catering aprons category is divided into handy to search sections, to make your life easier when you’re trying to find the right catering apron for your needs. Browse the following categories to find the right catering and chef aprons for you. Our extensive ranges of catering aprons within this categories include waist aprons, tabards, bib aprons and bistro aprons, as well as butchers aprons and disposable aprons. Our disposable aprons are suitable for one use only, making them the perfect choice for use in settings such as hospitals and care homes. Our chefs aprons, meanwhile, are suitable for use time and time again, and will withstand all the harsh treatment that goes with a professional catering environment, such as in a busy, commercial kitchen. Another option for catering aprons is to have them embroidered with your company logo to offer you a consistent look throughout your staff uniform. At Pattersons Catering Supplies, we can make arrangements for catering aprons to be embroidered. Choose the correct catering apron for your needs from our extensive range of chefs aprons. At Pattersons Catering Supplies, we also stock a wide variety of chef jackets, chef trousers, chef hats and more. See our chef clothing department to keep your staff looking good and working comfortably. If you have any questions about the range of catering aprons and chef aprons we stock here at Pattersons Catering Supplies, please contact our customer services department on 0117 934 1270, or email us on web@pattersons.co.uk for more information. 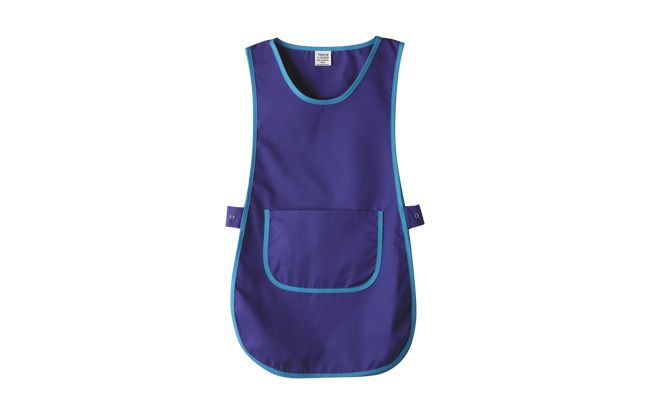 FREE UK delivery available on a wide range of catering aprons and clothing options.